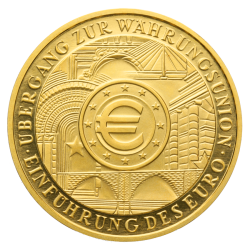 Gold Euros are issued by several EU countries to commemorate occasions, places of interest or national motifs. The most prolific producer is Germany which began issuing 100 and 200 Gold Euros in 2002 to commemorate the introduction of Euros. The Government of Germany has continued to issue strictly limited commemorative Gold Euros each year since. The FIFA World Cup Euro (2006),UNESCO World Heritage Site Euros and the German Forest series that began in 2010 are among the most popular. Struck from .9999 (24 carat) gold, their limited availability, exceptional purity and annually changing design has made them an essential buy for investors and collectors. Other countries that produce Euro gold and silver coins include France, the Netherlands and Austria.